Meizu announced the Meizu E2 smartphone. It comes with Mediatek chipset, Flyme OS 6.0 and a decent camera, but sadly, will be China-exclusive. The Meizu E2 has a 5.5” display of FullHD resolution. The chipset is Helio P20 with octa-core CPU clocked at 2.3 GHz and 3 GB RAM, with the storage being 32 GB. There’s also another version with 4 GB RAM and 64 GB storage, and if that’s not enough for you, the E2 has a microSD slot. An interesting feature is the 4-LED dual-tone flash, positioned right next to the 13 MP camera and integrated into the antenna band. Meizu put an 8 MP camera with f/2.0 aperture and 1.4 µm pixel size on the front. All this is powered by a 3,400 mAh battery with mCharge 3.0. The device has a price tag of CNY1,299 (about $188) for the 3GB RAM version and CNY1,599 (approx. $230) for the more powerful 4 GB RAM variant. 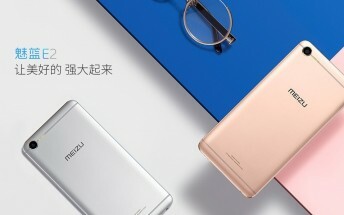 Pre-order starts today and will continue until April 29 when the Meizu E2 will actually ship.